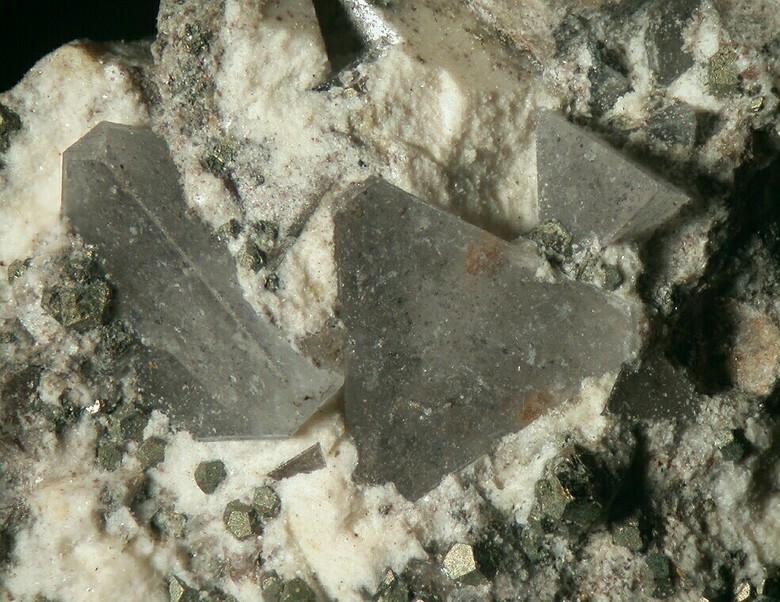 Zunyite: Mineral information, data and localities. Named after the type locality, the Zuni mine near Silverton, San Juan County, Colorado (USA). 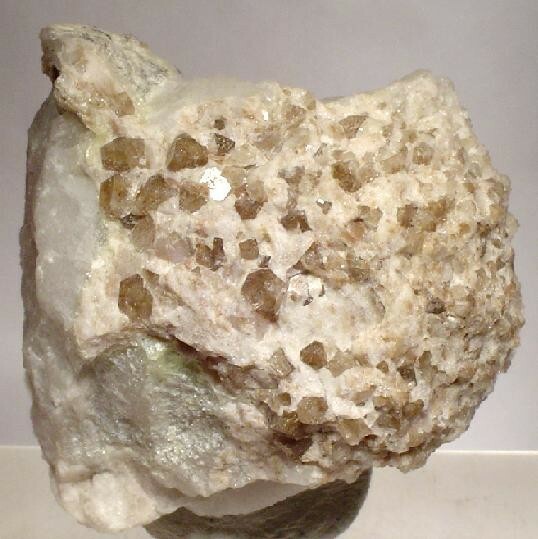 This page provides mineralogical data about Zunyite. Dillnite A F-rich zunyite variety. Originally described from Banská Belá (Dilln), Banská Štiavnica Mining District, Štiavnica Mts, Banská Bystrica Region, Slovak Republic. Diaspore 11 photos of Zunyite associated with Diaspore on mindat.org. Quartz 7 photos of Zunyite associated with Quartz on mindat.org. Hematite 1 photo of Zunyite associated with Hematite on mindat.org. Feldspar Group 1 photo of Zunyite associated with Feldspar Group on mindat.org. 9.BJ. 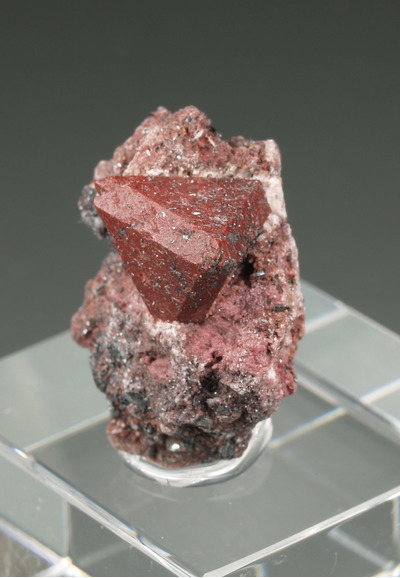 Arsenmedaite Mn2+6 As5+Si5O18(OH) Mon. Proceedings of the Colorado Scientific Society (1884): 1: 124-132. Bulletin de Mineralogie: 97: 271-277. Louisnathan, S.J., Gibbs, G.V. (1972): Aluminium-silicon distribution in zunyite. American Mineralogist, 57, 1089-1108. Acta Crystallographica (1982): B38: 390. Zhou B, Sherriff B L, Taulelle F, Wu G (2003): Nuclear magnetic resonance study of Al:Si and F:OH order in zunyite. Canadian Mineralogist 41, 891-903. The following Zunyite specimens are currently listed for sale on minfind.com. Turco, G. (1962). La zunyite: recherches expérimentales physico-chimiques en liaison avec l'étude du nouveau gisement de Beni-Embarek. 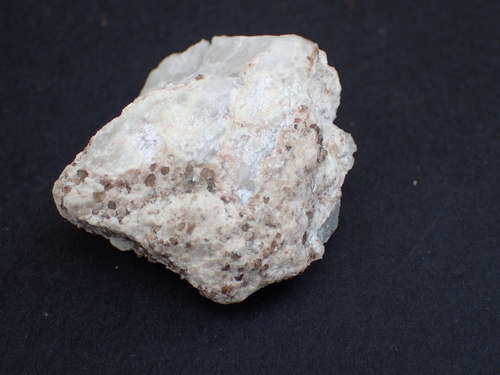 Masson et Cie.
Sillitoe, R.H., Steele, G.B., Thompson, J.F.H., and Lang, J.R. (1998): Mineralium Deposita 33, 539-546. Hikov, A., Lerouge, C., Velinova, N. (2010): Geochemistry of alunite group minerals in advanced argillic altered rocks from the Asarel porphyry copper deposit, Central Sredno¬gorie. Review of the Bulgarian Geological Society 71, 133-148. Chambefort, I., and Moritz, R. (2007): Mineralium Deposita 42, 665-690.; Georgieva, S. & Velinova, N. (2012): Alunite from the advanced argillic alterations in the Chelopech high-sulphidation epithermal Cu-Au deposit, Bulgaria: Chemistry, morphology and genetic significance. Geochemistry, Mineralogy and Petrology 49, 17-31.; Georgieva, S., & Георгиева, С. Albite in the propylitic zone of alteration from the Chelopech high-sulphidation epithermal Cu-Au deposit, Bulgaria: new data Албит от пропилитовата зона на изменения във високосулфидизираното епитермално Cu-Au находище Челопеч, България: нови данни. C. Mavrogonatos, P. Voudouris, P. Spry, V. Melfos, S. Klemme, J. Berndt, C. Kanellopoulos, R. Moritz (2018): First zunyite-bearing lithocap in Greece: The case of Konos Hill Mo-Re-Cu-Au porphyry system. The 1st International Electronic Conference on Mineral Science, 16-31 July 2018, Proceedings, 12 pp. (https://sciforum.net/paper/view/conference/5450); Mavrogonatos, C., Voudouris, P., Spry , P.G., Melfos, V., Klemme, S., Berndt, J., Baker, T., Moritz, R., Bissig, T., Monecke, T. & Zaccarini, F. (2018): Mineralogical study of the advanced argillic alteration zone at the Konos Hill Mo–Cu–Re–Au porphyry prospect, NE Greece. Minerals 8, 479. Alfredo Petrov specimen, via Kotaro Watanabe. Alfredo Petrov specimens, from Yamamoto collection. Economic Geology; December 2009; v. 104; no. 8; p. 1087-1110; Khashgerel, B. E., Kavalieris, I., & Hayashi, K. I. (2008). Mineralogy, textures, and whole-rock geochemistry of advanced argillic alteration: Hugo Dummett porphyry Cu–Au deposit, Oyu Tolgoi mineral district, Mongolia. Mineralium Deposita, 43(8), 913-932. Dill, H.G., Bosse, H.-R., Henning, K.-H., Fricke, A., and Ahrendt, H. (1997): Mineralium Deposita 32, 149-163. Graton, L. C.; Bowditch, Samuel I. (1936): Alkaline and acid solutions in hypogene zoning at Cerro de Pasco. Economic Geology 31, 651-698. Bacsó Z., 1971: Nové minerály a nové surovinové možnosti Vihorlatu. Min. Slovaca, 3, 11, 247-250. Minerals of South Africa; Zhou, B., Sherriff, B. L., Taulelle, F., & Wu, G. (2003). Nuclear magnetic resonance study of Al: Si and F: OH order in zunyite. The Canadian Mineralogist, 41(4), 891-903. Galbraith. F.W. & D.J. Brennan (1959), Minerals of AZ: 93; Anthony, J.W., et al (1995), Mineralogy of Arizona, 3rd.ed. : 432; Wilson, W.E. (1986), What's new in minerals, Min.Rec. : 17: 210, 404-405. Winant, A. R. (2010). Sericitic and advanced argillic mineral assemblages and their relationship to copper mineralization, Resolution Porphyry Cu-(Mo) Deposit, Superior District, Pinal County, Arizona (Doctoral dissertation, University of Arizona). Anthony, J.W., et al (1995), Mineralogy of Arizona, 3rd.ed. : 432; Schwartz, G.M. (1953), Geology of the San Manuel copper deposit, AZ, USGS PP 256. O'Neill, L. C. (2014). REE-Be-UF mineralization of the Round Top laccolith, Sierra Blanca Peaks, Trans-Pecos Texas (MS dissertation).